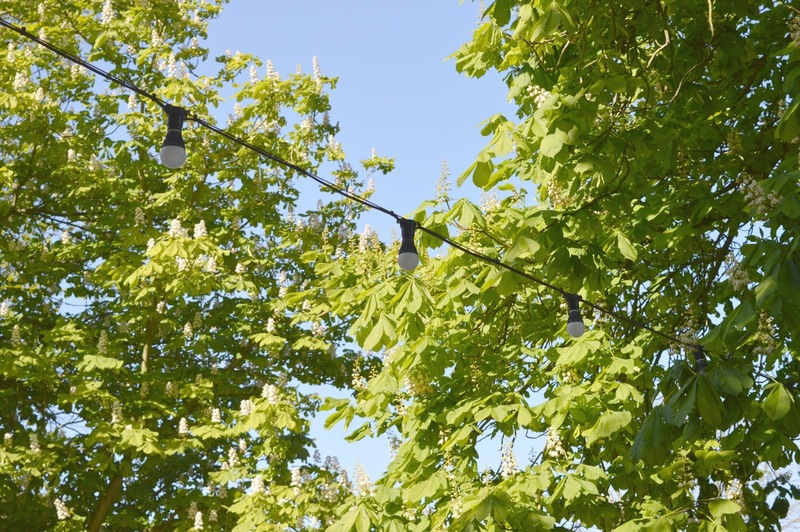 Since first visiting the National Trust site at Gibside we've been curious to try out the Gibside Pub that opens every Friday and Saturday evening under the cover of the beautiful trees of the Market Place. With free admission from 4:30pm, the cafe is transformed into the Gibside pub each weekend and I honestly can't think of anywhere better to enjoy a few drinks with friends. It really is the best beer garden in the North East! On a particularly beautiful sunny Friday we decided it was the ideal time to finally spend an evening at the Gibside pub and, with a cheeky day off work for both of us, we took advantage of being able to get to Gibside as soon as the Beer Garden opened for the evening. I would advise getting to the Gibside pub as soon as it opens at 4:30 pm. 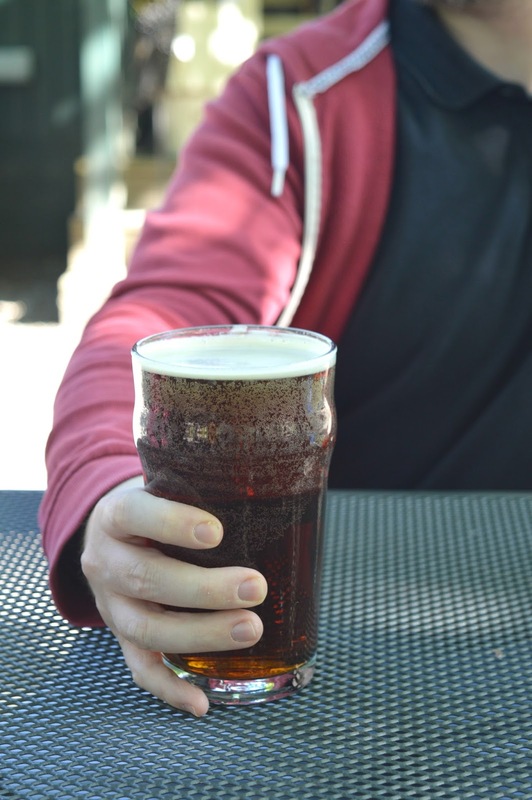 As you can imagine the best beer garden in the North East is a little popular so you'll need to beat the crowds to have your pick of the tables. For the lucky few who arrived early there were a few seats still in the sunshine to grab and for those sitting in the shade of the trees it was easy to get a spot near the fires which would be much appreciated when the sun started to go down. It was pretty quiet when we first arrived and we had our pick of the seats but by 6:00 pm every table was full with people still arriving. Those in the know had brought their own chairs so if you can't get to the beer garden for opening time, definitely take yourself something to sit on. Enthusiastically early as always, we were the first at the bar so took our time to study the small selection of drinks and were very happy to discover that the prices were pretty reasonable. With some local Wylam ales on tap as well as bottled ciders, lagers and wine (by the glass or the bottle) we had plenty of change from a £10 which is pretty unheard of if we'd been drinking in our favourite bars in Newcastle. Although it had been a pretty warm and sunny day in the North East the Gibside Pub was chilly. The tables are almost entirely under the trees in the shade and although very pretty it wasn't long before we were feeling a little cold. I was very thankful that I had on several layers and even though it certainly wasn't the normal outfit you'd wear to the pub on a Friday night I was so thankful to keep snuggly. If you're planning a visit definitely make sure you take spare emergency jumpers! Of course after a few bevvies it didn't take long before our mind had wandered towards food and we eagerly made our way down to the pizza oven to see what was on offer. 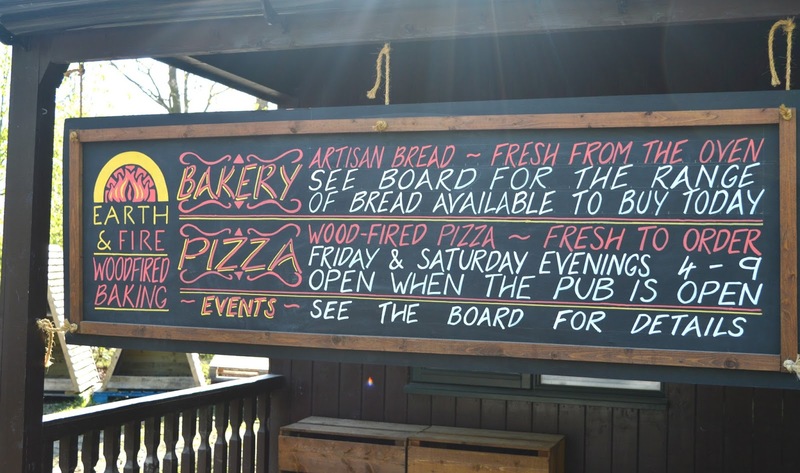 Wood-fired pizza is freshly made to order on site and there's an impressive menu of toppings to choose from. Stay a while and watch your dinner get created or simply take a seat and wait for your number to be called. Our pizzas took around 10 minutes and were served on disposal plates for us to enjoy at our table. 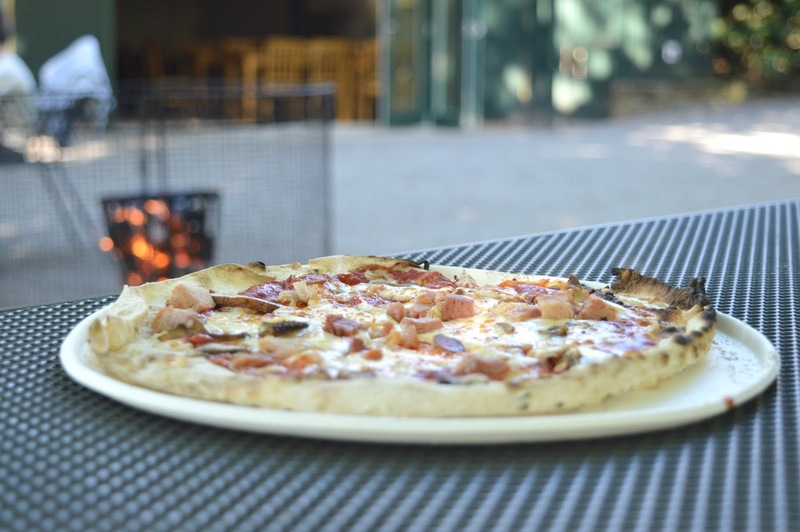 I went for the Ham and Mushroom (£6.00) - the thin crust was slightly charred at the edges which added to the wonderful alfresco dining experience. Served piping hot with plenty of toppings we happily devoured our pizzas snuggled round the fire pit. Pizza in the best beer garden in the North East, Bliss! With my tummy nicely warm with pizza I decided that the perfect end to my meal would be an indulgent hot chocolate. 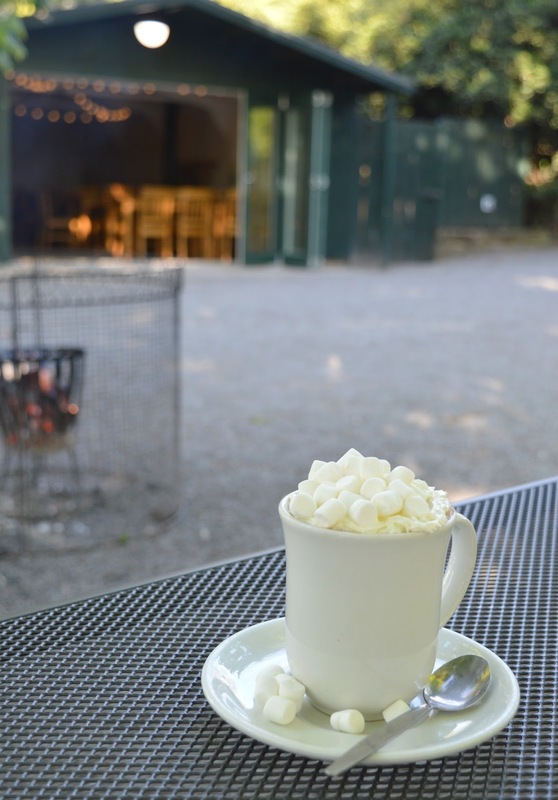 Hardly rock and roll but at the Gibside Pub it's all too tempting to enjoy a post pizza latte or hot chocolate. Served with a generous mountain of cream and with marshmallows tumbling off the top, it was the perfect end to our evening. The Gibside Pub is pretty special as it's one of only two National Trust owned pubs in the country! There was a wonderful atmosphere with plenty of families, dogs, couples and groups of friends enjoying the early evening sunshine. 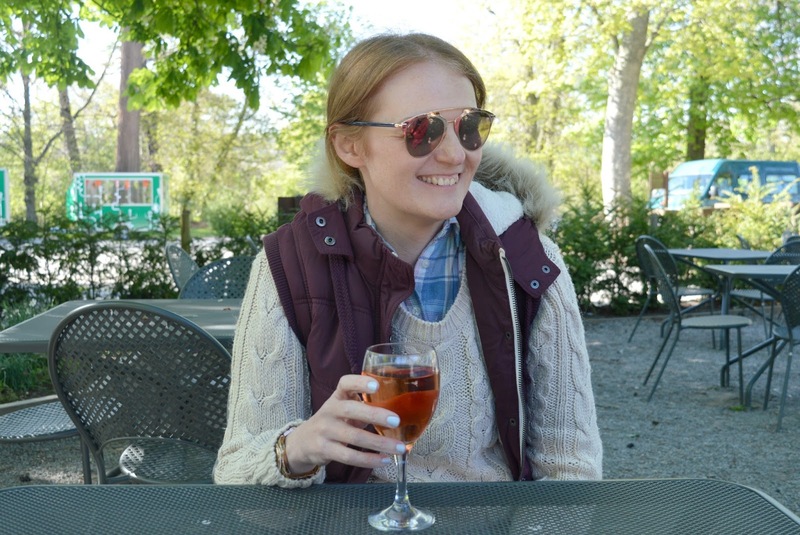 I don't think I've ever enjoyed a glass of wine in such a relaxed environment and I'm pretty keen to make the Gibside our local for the Summer. 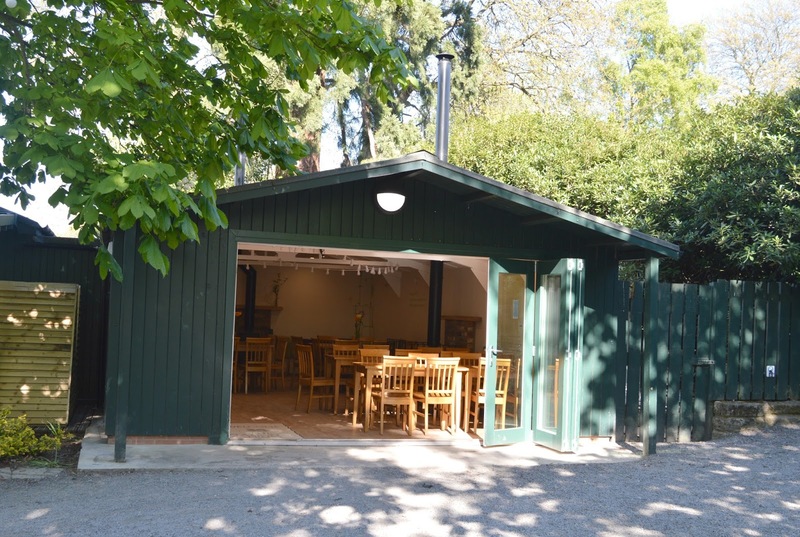 As it turned cooler we retired to the indoor cafe to warm up a little, it's great that the Gibside Pub can go ahead come rain or shine with plenty of undercover seating available. There are plenty of monthly feature nights to keep you entertained with live music at "Showcase Night" the first Friday of every month, "Beer and a Bite Night" featuring some of your local favourite food traders every third Saturday and "Board Games Night" every fourth Saturday. As an extra special treat Gibside have extended their opening hours until 30 September. On pub nights you can access the wider Estate until 9:00 pm (last admission 8:00 pm) on Fridays and Saturdays. Normal admission charges apply or if you're a member you can wander for free. My head is already filled with the idea of romantic evening picnics on the lawn! 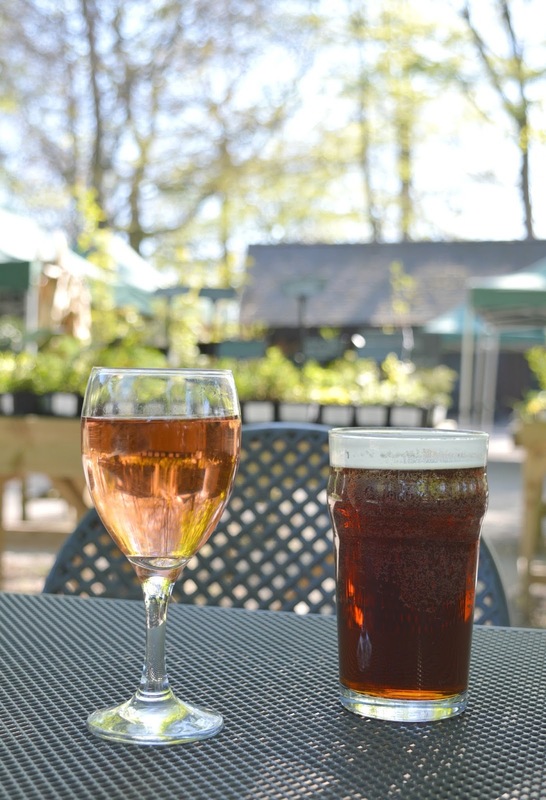 Let me know if you've made it to the Gibside Pub and if you have any recommendations for great beer gardens in the North East. For more inspiration of things to do in the North East this Summer check out New Girl in Toon on Facebook here.